Navigation in SalesforceIQ highlights the key features of the app while dedicating more space for your most valuable content. Intelligent List display—SalesforceIQ automatically and intelligently selects your most important Lists and displays them at the top of the screen. Click the downward-pointing arrow to the right of the List names to access all your Lists, and drag and drop to change the List order. Entry of new opportunities, leads, etc. directly from a List—To add a new object such as an opportunity, lead, or other type of relationship to an existing List, navigate to the desired List and click Add [List object]. 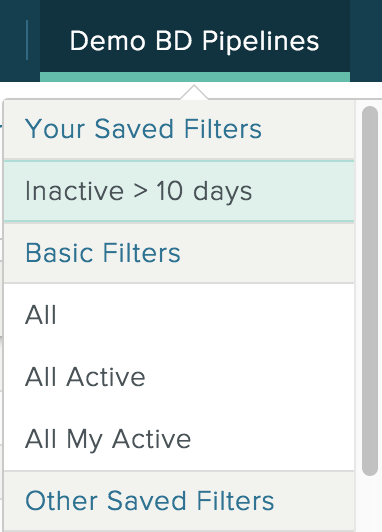 List-based saved filter display—To quickly access your saved filters, hover over the relevant List name and select the filter. Easy email access—You can compose email, view drafts, and view undelivered emails directly on the Home screen. Consolidated address book—You can find both Accounts and Contacts by clicking at the top of the screen. Unified settings—Click at the top of the screen to access all your settings. If you have multiple Organizations, you can switch between them on the Settings screen. Quick Help center access—Click at the top of the screen to access our full Help Center. Notifications—Click at the top of the screen to view your notifications. The number that appears above the icon indicates the number of unread notifications. You receive a notification if someone includes you in a Stream comment, adds you to a team or Organization, or performs some other task in SalesforceIQ that is related to you.